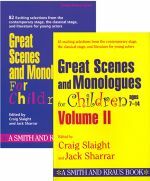 With 79 exciting selections from the contemporary stage, the classical stage, and literature, this collection offers scenes and monologues from children’s novels and fairy tales as well as an eclectic mix of older drama and short story. Elementary students and teachers will enjoy scenes from children’s classics such as The Secret Garden, Little Women, and The Emperor’s New Clothes. Monologues have been chosen from such contemporary works as You’re a Good Man, Charlie Brown, Heidi, and Peter Pan. The inclusion of mature selections such as Thornton Wilder’s The Skin of Our Teeth broadens the appeal of this book to young adults for speech and drama study. Read more...A brief plot synopsis introduces each selection, encouraging readers to refer to the complete work. This practical compilation provides a broad range of material with a wide spectrum of uses all in one simple text. The theatrical journey through classical and contemporary literature continues with this second volume, including 19 scenes and nine monologues from dramatic literary works such as The Adventures of Huckleberry Finn, Anne of Green Gables, The Boy Who Stole the Stars, Dogbrain, Pinocchio, The Invisible Man, and more. Scenes have cast sizes from two to five and run from 10 to 20 minutes. As in the first volume (See above. ), a brief plot summary sets the scene for each selection, inspiring readers to refer to the complete work. This unique book of 100 monologues invites elementary school students to explore a wide range of emotions, developing empathy as well as acting skills.